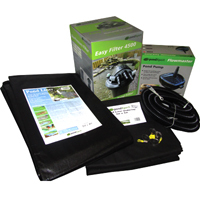 Fish Mate 10000 Pressure Filter & 5000 Pump Set: Pump and Filter Sets: Pump and Filter Sets - Buy pond equipment from Pondkeeper: fishing out the best deals on the net. This Fish Mate pressurised filter features 'Powerclenz' automatic cleaning system and comes with a matching pond pump. 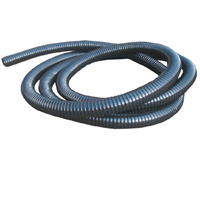 A perfect pond solution for ponds sized up to 10,000 litres (2,200 gallons). 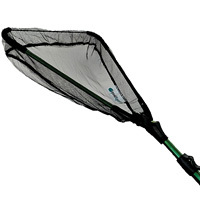 By simply twisting a knob on the Fish Mate 10000 filter it automatically cleans itself! In the 'run' position the water undergoes a 4-stage purification process. Simply turn the knob to "Clean" and the foams are squeezed by up to 1,000lb of water pressure forcing out pond sludge. The back-flushed dirty water is then pushed out through the second waste outlet (typically down the drain or flowerbeds). 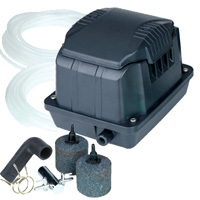 This unit boasts a built-in 9w UVC and guarantees clear water for ponds up to 10,000 litres. (Figures based on pond in full shade with water plants - 5,000 litres for ponds in full sun). The pump supplied with this kit is the Fish Mate 5000. 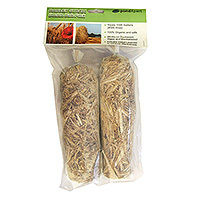 * Save £51.99 compared to buying pump & filter separately.